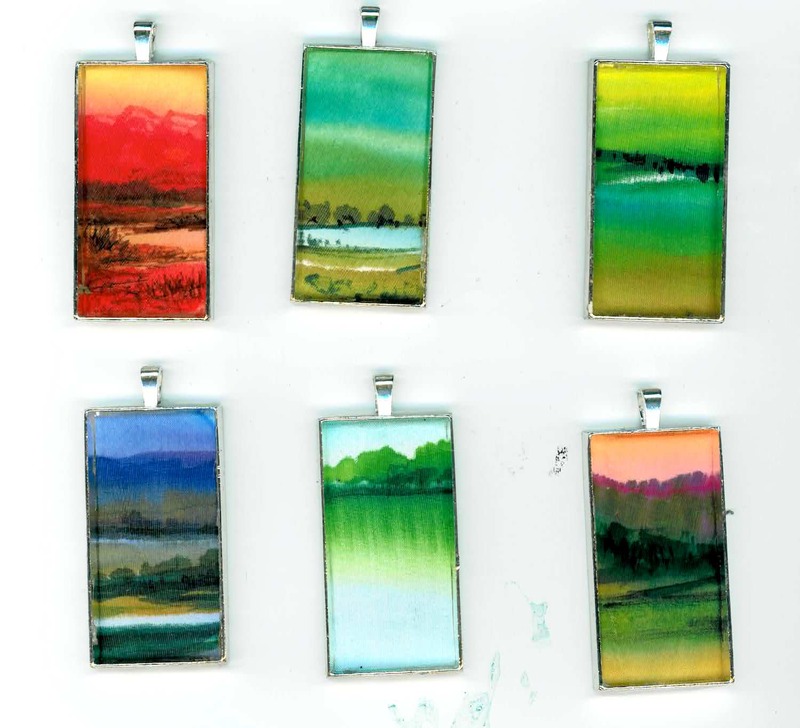 These six pendants are headed off to 4 Corners Picture Framers in Canberra. I am so pleased that Carol and John called in to buy some matted works which they will frame for re-sale. I know they will frame them well and do hope they sell quickly for them so they get a return on their investment. They purchased some silk brooches and paid these pendants which I have just finished for them. (posting after the long weekend). Carol and John have a lovely gallery display (though I have only viewed on line) and I do hope I can visit Canberra later in the year to see their 2 venues and say hello again. They are so enthusiastic about art, I was fortunate that they called in to Burnie Makers Workshop and found my work. Their preferred was the more contemporary semi-abstracted watercolours which I so love doing as they allow the creative juices to flow. You can order a pendant of this style for yourself or as a unique gift… original watercolour on silk (NOT a print of a work, this is the real thing! ), in a silver tray with glass cabochon over, 25×50 mm. Silver snake chain included if requested at no extra cost. Order in a colour to suit you. I will pay postage. Only $40 AUD. (wholesale discount on enquiry). This is absolutely beautiful! I so wish to order one of these pendants! My son lives in Hobart and I( his mother), live in Cape Town ,South Africa! Is there anyway to go about buying one? What would you suggest?